The Baroque wedding ring is beautifully adorned with a deeply engraved ornate pattern extending fully around a 7mm flat court band with comfort fit. 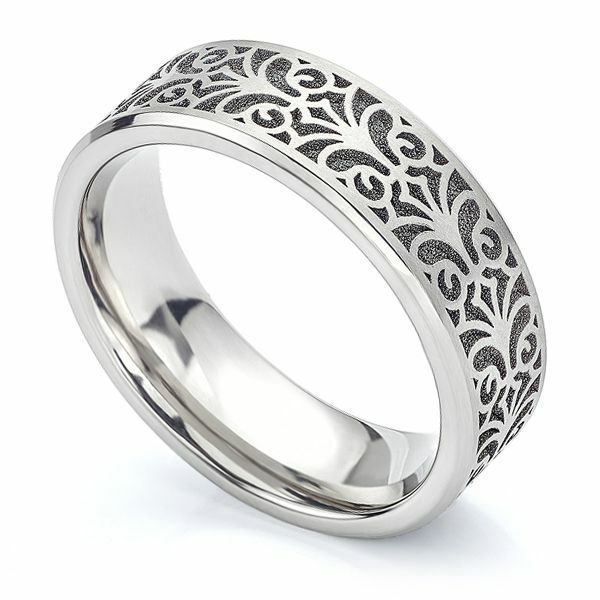 The Baroque patterned Wedding Ring features an ornate, lattice style pattern, deeply engraved over the surface of a Titanium Wedding Ring. The ring itself is crafted from industrial grade Titanium, benefitting from being 100% hypo-allergenic and extremely durable. Beautifully styled with a flat court profile, this unusual design includes a curved inner comfort fit—gliding effortlessly onto the finger, ideal for daily wear. Each ring is crafted to order—delivered in exquisite Serendipity packaging and beautifully presented ahead of your big day. Please feel free to contact a member of our helpful team if you require any additional guidance ahead of your purchase.